Canon and Nikon, the two major photo equipment manufacturers from Japan, have long been engaged in a titanic slugfest. Sometimes one gains the upper hand, sometimes the other. But in the cash rich US market, which is a prime target for camera manufacturers, it is Canon that enjoys the lead in terms of overall sales. This is in no small measure due to its vastly popular range of SureShot and PowerShot compact cameras. Nikon, however, has made heavy weather of it in the same segment. This is hardly surprising given its mindset, which has traditionally been focused on SLR cameras ever since the venerable Nikon F hit the market in 1959. Nikon’s compact camera offerings, while not exactly paragons of excellence, managed to satisfy those who felt the Nikon reputation for excellence rubbed off on them if they were seen flaunting a colorful little camera that happened to bear the legendary Nikon name and which was capable of taking fairly good pictures. 2011 must have been a good year at Nikon Corporation. The D7000, Nikon’s flagship DX model, had received rave reviews and there was a huge backlog of orders, and not just because of the floods that had crippled the Thailand plant where the D7K was manufactured. The D3100 was outselling everything in sight, and sales of the D5100 had gone through the roof. It was almost as if Nikon had it all pretty much wrapped up. Thomas Jefferson had said “Eternal vigilance is the price of liberty”. 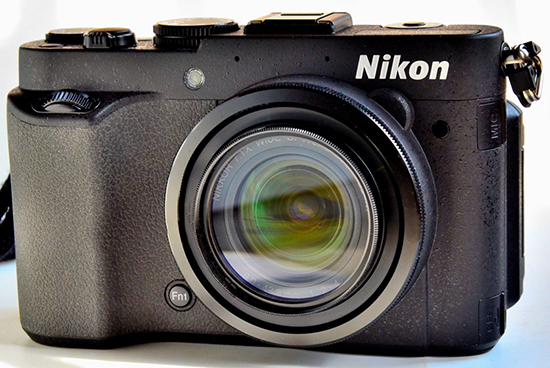 And Nikon had learned its lesson — corporate complacency was a definite doom. In retrospect, their designers, visualizers, engineers and corporate honchos must have made 60-day weeks a habit. The proof of the pudding was in the eating. 2012 was The Year of The Nikon, if I may so say. No pigs, dragons or other wild life or livestock for me, begging your pardon. The D3200 with its 24 MP sensor was followed by the fabulous D800 and the D800E, both fitted with a new 36 MP sensor and advanced C3 processor. 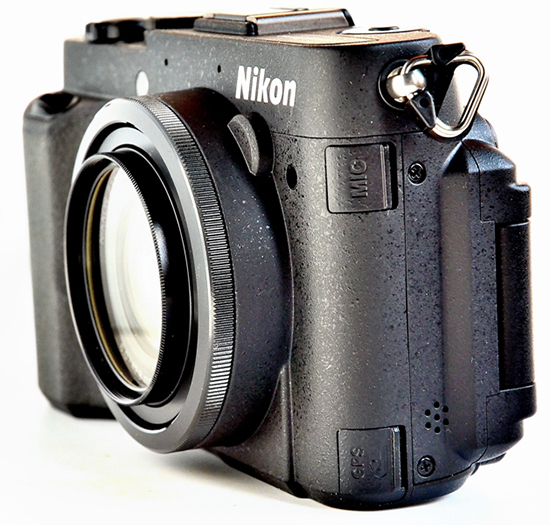 The magnificent Nikon D4 had already sealed the victory when the low-end FX model, the D600 was launched. 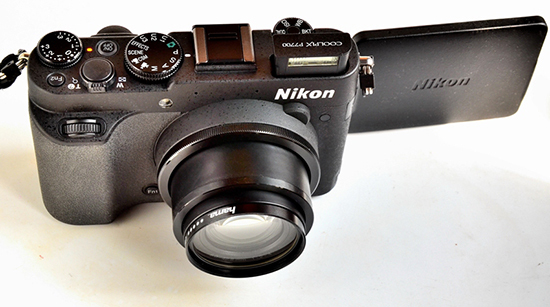 Compact, lightweight, with a 24.2 MP sensor, the D600 was a big hit. Nikon had covered all its bases well. High pixel counts but no sign of noise. In fact, high ISO performance in low light was mind boggling. The self-styled experts dived for cover as Nikon bent the laws of physics with the aid of newer, better mathematical algorithms that rolled back all the earlier theories pertaining to luminous and chroma noise at high ISOs. True, Canon’s new 5D Mk III was a great camera, but the low light performance of its 22MP sensor was no match for the D800’s. Check out this news article over at CNET. Nikon went a step further in the D800E, removing the anti-aliasing filter to give it the image quality hitherto never seen before in a full-frame camera. Canon took such a battering that the referee had to stop the fight, declaring a technical knock-out. Canon, nose bleeding profusely, was carried away on a stretcher. By the looks of things, Nikon seems to lay great store by age-old maxims like “Try, try, try again!”, “Third time lucky!” and “Imitation in the best form of flattery”. Somewhat lost in compact camera territory, Nikon set out to produce a copy of Canon’s then bestselling PowerShot G11. All they succeeded in doing was producing a copy-cat version called the Coolpix P7000 that resembled G11 closely in everything but performance. When they launched the slightly upgraded P7100 in 2012, Canon’s new G12 promptly slew it. In retrospect, the Nikon designers must have decided to follow Britannia India’s advice to “Eat Healthy, Think Better”. The tasks before them were to reduce the bulk, rationalize the features; add those that would enhance hands-on control, upgrade the sensor / processor, give it a faster lens that retained the class leading zoom range (7.1 X, 28-200mm), add a fully articulated LCD monitor, make it rugged enough to withstand rough use — the list was obviously a long one. 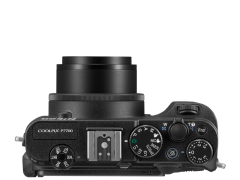 August 2012 saw the new flagship Coolpix P7700 sail out from under Canon’s shadow. It streamlined the camera’s appearance by dropping the viewfinder which, in any case, was almost useless given the impressive 28-200mm zoom range. The 3″ (brightness adjustable in 5 steps) fully articulating 921K LCD more than made up for the loss. Despite the dated (2010) EXPEED C2 processor (we’ll go into this disappointing feature later), the new BSI (Back side illuminated) 1.7″ 12.2MP CMOS sensor was now able to do full justice to the faster new (f/2 to f/4 as opposed to the f/2.8~5.6 of the D7100) fixed zoom lens (filter size 40.5mm). The one-stop jump in speed puts the P7700 more less at par with its rivals. Canon’s new G15, while also opting for a 1.7″ 12.2 MP sensor, retained the optical viewfinder but opted for a fixed screen while eliminating the articulating LCD screen that had won Canon G series such a large fan following. Moreover, image to image, it fell just a tad behind the new Coolpix P7700. Fans rejected the G15 en masse, going back to the time-tested G12. It was a small triumph for the Coolpix team. The P7700 is not in the usual sense of the term — a ‘compact’ camera. At 118.5 X 72.5 X 50.4 mm and with a light but nevertheless metal (magnesium alloy) frame, it’s too big and heavy for a shirt pocket. It’s more suited for a jacket pocket or the small Lowepro–type bag that comes free with the camera (in India). Many would say it is compact only in the sense that it’s much smaller than a DSLR. At 393 gms, it isn’t all that light, either. But for someone like me with fairly large hands, and for whom the P510 superzoom, weighing 555gms, seems tiny and light as a feather, the P7700 is small and light indeed. Over the past year, I had often considered buying the P7100, but a little voice in my head asked me to wait. Now the voice was silent. Once again, I found myself at a Nikon dealer (it was getting to be a habit, I told myself ruefully). It was the 12th of November 2012. Once again, 22K slid smoothly into the man’s cash drawer. The Coolpix P7700 was my Diwali gift to myself. This time, I didn’t walk out shooting. I was field-testing another camera in Shahjahanabad, Delhi’s Old Quarter, also known as the ‘Walled City’, so the P7700 had to take a back seat. The 6th of January 2013 proved to be a very chilly day, but I had an important meeting in Connaught Place. What a great opportunity to put the newcomer through its paces! A cold wave was sweeping across north India and hordes of people in search of inexpensive woolens thronged the open air Palika Bazar market. The conditions were ideal for shooting — a late afternoon sun cast golden light filtered through trees, over a scene frantic with activity. The fast lens allowed me to use medium-high shutter speeds at base ISO (80). I had switched to silent mode (accessible through the set-up menu) by turning off the synthetic shutter sound and all beeps and stealthily shot a few frames (all jpegs by the way; though the P7700 has a RAW option as well). No one heard me or noticed me. I shot some colorful shop windows, using the articulating LCD to good effect, shooting over people’s heads or catching the action from ankle height. The P7700’s top deck fairly shouts that it is an enthusiast’s camera. It seems to have a dial or button for everything. Apart from the beautifully click-stopped mode dial, there is a knurled dial offering ±3 — yes, you heard right — plus-minus three stops of exposure control. Very few cameras offer more than two stops compensation leeway. Even the much pricier (in India) Fujifilm X10 / X20 offer only ±2 stops compensation! Anxious to preserve highlights, I set the dial at a full -1 stop negative exposure. I could always pull up the shadows later, in post processing, even in jpegs. At base ISO (80), the chances of noise creeping into shadow areas were negligible. An orange LED acts as the null point for the ±control, glowing orange whenever compensation is dialed in — an excellent feature. I tell you, this is a very well thought out instrument, full of clever little touches to sugar the deal. The mode dial is a good example of the P7700’s eye for detail. There is the usual P mode (flexible program; shutter speed / aperture combinations changed by turning the main command dial near the thumb rest), A for aperture priority (you select the aperture with the sub-command dial in front), S for shutter priority (you set the shutter speed by turning the main command dial and the camera automatically selects the aperture), Full Auto (you just point and shoot), Scene (20 canned presets, including Scene Auto Selector, portrait, landscape, night portrait, pet portrait, etc. ), Effects (including creative monochrome, cross process, defocus during exposure, zoom exposure, soft, sepia, painting and high/low key), Movie and Custom Movie (the latter offering optional aperture / shutter speed/WB settings for use in movie mode, with full optical zoom), and three user configurable groups of U-for-User settings covering all the usual shooting parameters. That was awesome! Even the much vaunted D7000 SLR offers only two. This was equivalent to carrying around four cameras in one because, with one twist of the dial, I could access a completely different set of shooting parameters that totally changed the camera’s operating priorities. Just above the exposure compensation dial is the Fn2 button which offers artificial horizon, histogram and grid lines in the LCD. You can (and I did) select all three at one go! The fourth option is a 3-stop neutral density filter, which I then set at Fn2. I might need it in case I was shooting in such bright light that even with base ISO, I’d need a shutter speed higher than the maximum offered by the camera, which is 1/4000th second, for shooting wide open, i.e., at full aperture – f2, f4, or anything in between. Note that the Sony RX 100 doesn’t have a neutral density filter, though the Fujifilm X10 / X20 both have it. Moving to the left of the top plate, past the shutter button and zoom toggle, we find the hot shoe (fitted with the plastic BS-1 hot shoe protector) beyond which is the click-stopped ‘Quick Menu’ dial offering swift access to image compression/size, ISO, WB (white balance), auto bracketing (shutter speed, aperture or WB), My Menu (which can be set to offer a selection of frequently used menu items), and ‘picture contro’’, i.e., image quality settings such as Standard, Vivid, Neutral, Monochrome, etc. I love this dial and use it frequently. Above it, submerged flush with the top plate, is the pop-up flash, which rises when a small tab (demarcated by lightning bolt and Pac-Man symbols) just below it, on the back of the camera, is pushed up. A note on the flash capability of the P7700: The pop up flash can be programmed within the menu to act as a flash commander for a single off-camera Nikon Speedlight, synching at up to 1/2000th sec due to the then active electronic shutter! Awesome! Only the top-of-the-DX-line Nikon D7000 DSLR can do this! 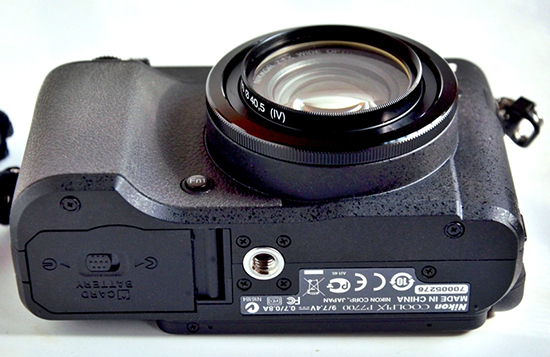 Flash output can be compensated within the shooting menu (Nikon SB-400 flash only). Nikon obviously feels the P7700 can be used for more than just recording baby’s first step!! Judging by the great results I could get up to ISO 1600, I would agree wholeheartedly. The P7700 sure is one handsome specimen! Only available in all-black, the P7700 evokes the classic rangefinder look. On the left is the large, stickily rubberized, soft hand-grip which will pamper your shooting hand throughout the day. Atop it, canted at an ergonomically correct angle, sits the sub-command dial that is used to change the apertures in both manual as well as aperture priority mode. That’s about all it does, though. Above the big f2 ~ f4 zoom with its hypnotic green-orange multi-coating is the autofocus illuminator, while above it (just below the hot shoe) are two tiny holes: the stereo microphones. To the right of the lens is a near invisible dot that receives the IR (infrared) pulse from the optional ML-L3 IR remote control. Low down on the left, below the lens, is the Fn1 button, which can be programmed from within the menu. Acting in concert with the shutter button, main command dial or the multi-control wheel on the back, it offers a whole raft of options. Now is the ideal time to bring it up — the P7700, in case you weren’t counting, offers six control wheels — the three dials on the top deck, the two command dials and the multi-selector’s ring! Anyone who wants more customizable controls must be nuts! The right side of the camera (still looking at it from the front) hosts two tough plastic covers which conceal the MIC (optional external microphone ME-1) and GPS (optional GP-1) ports. A small monaural speaker is located between the GPS flap and the hinge of the LCD monitor. The left side of the camera has a plastic covering for the AV and HDMI ports. This also accepts the MC-DC2 wired remote control. Lower down, at the base, is a hinged cover made of tough plastic that hides the receptacle for the optional AC Adapter EH-5b. In my book, any camera offering AC adapter facility is built tough enough to easily withstand the pressure of a day-long shooting session. Continued in Part II of the review.